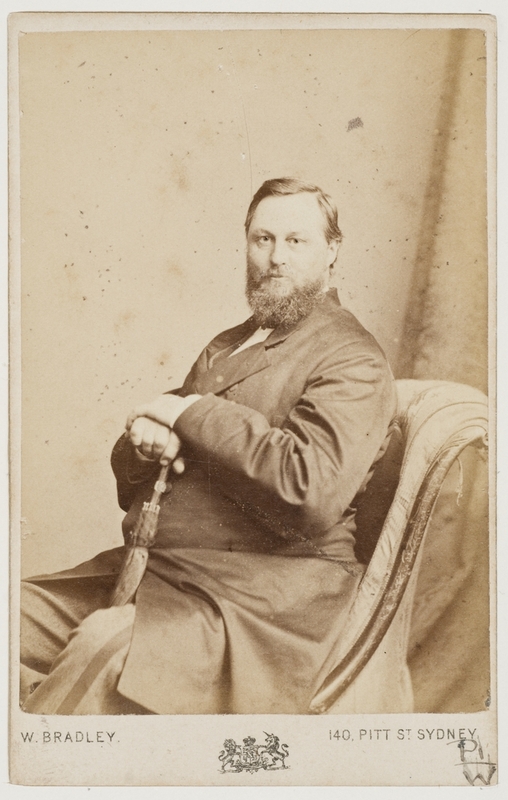 George Wyndham (1801-1870) arrived in New South Wales from England with his wife Margaret in 1827 and settled at Branxton in the Hunter Valley region. 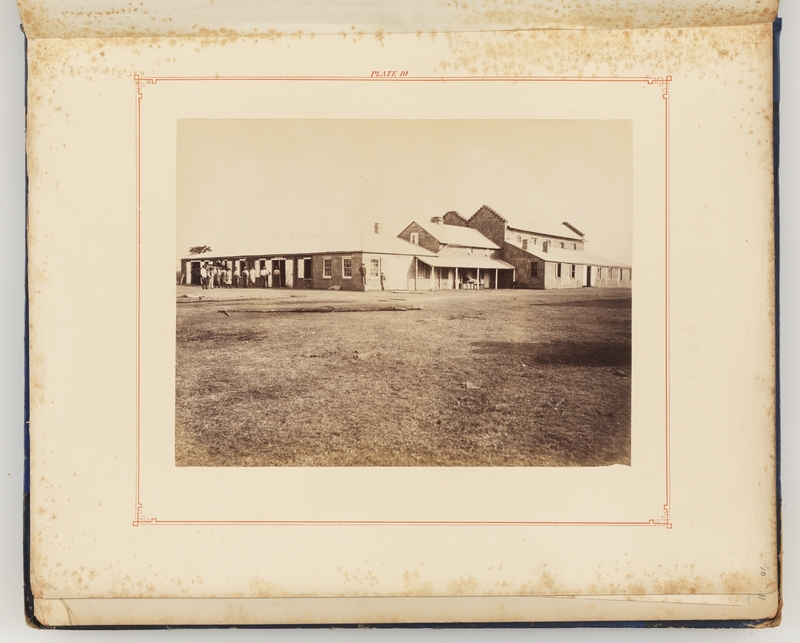 On his property, ‘Dalwood’, Wyndham raised cattle, horses, sheep and experimented with a variety of crops including maize, wheat, tobacco, fruit and vines, systematically trialling over 70 different varieties of grapes alone. 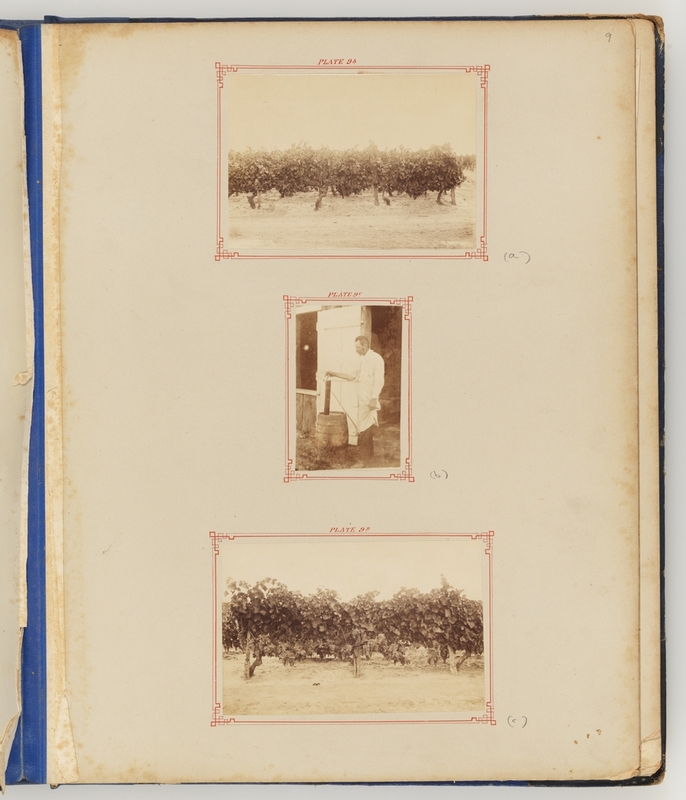 Through a process of trial and error, he selected the best growing grapes for the local area and conditions, becoming a pioneer of the wine industry in Australia. 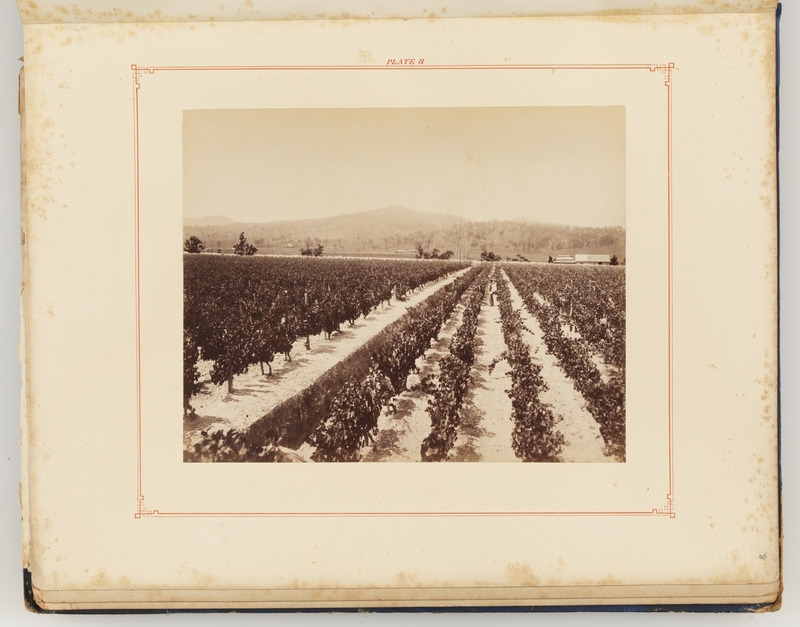 He was later joined by his son John Wyndham who eventually took over management of the property and oversaw the growth of Dalwood vineyards into one of Australia's leading wine producers. 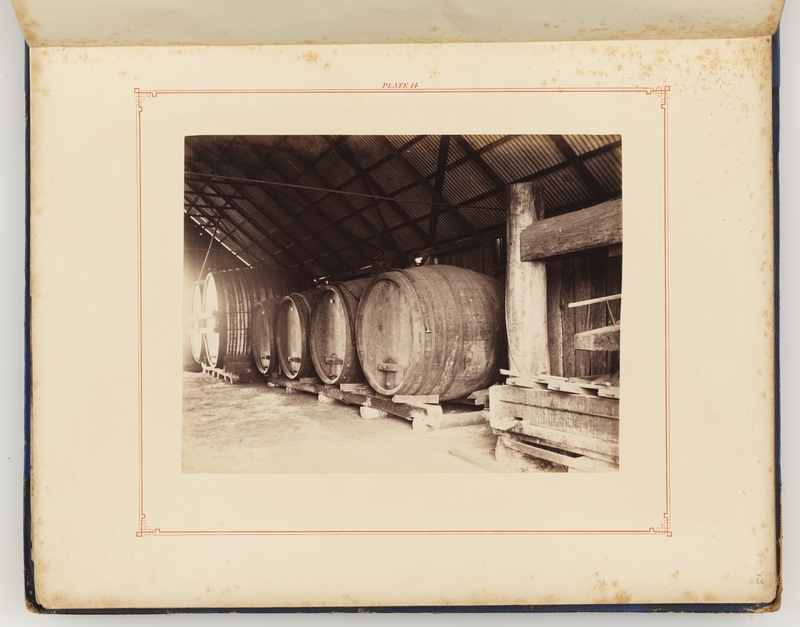 By the late 1880s, the Hunter region of NSW was becoming a centre for wine production in Australia. 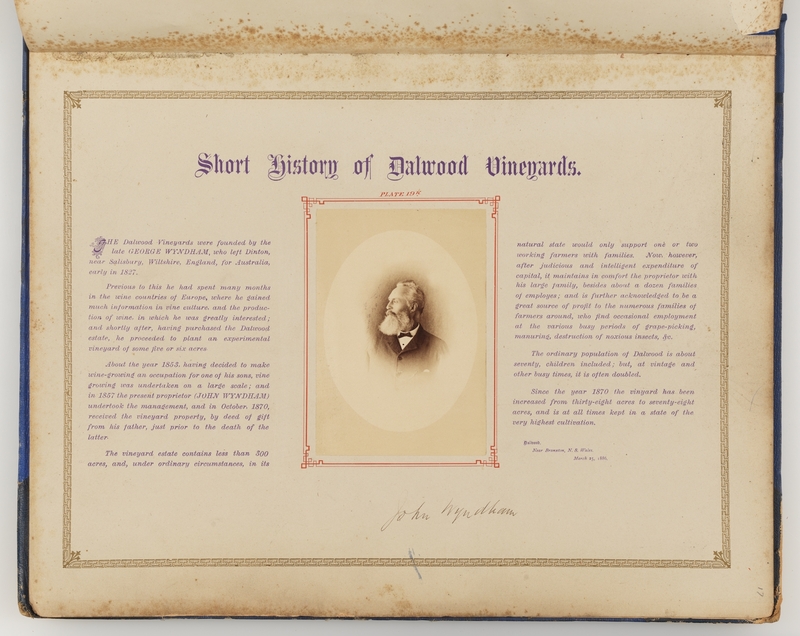 Dalwood wines were internationally acclaimed, receiving awards at local and international exhibitions, including the Paris International Exhibition of 1867. 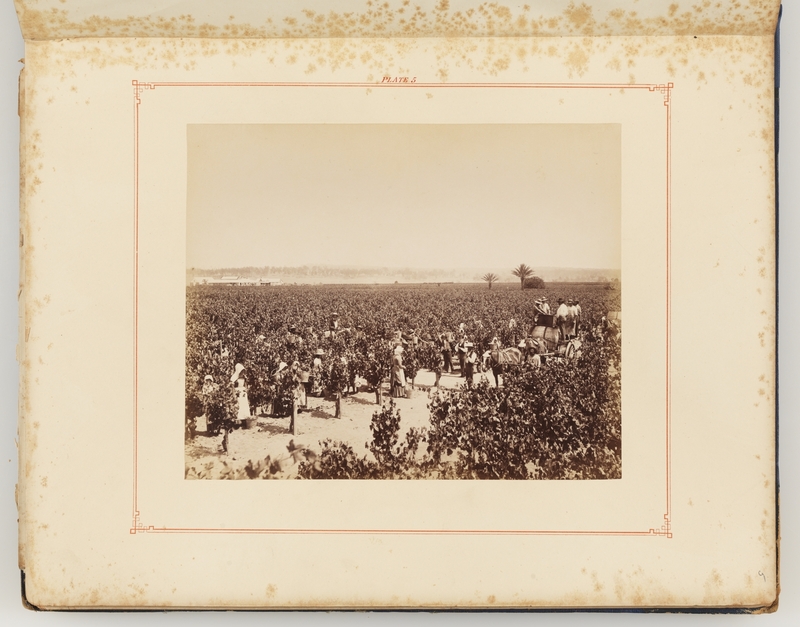 At the height of Dalwood's success in 1886, a number of promotional photographs of the vineyard were produced and presented to various local dignitaries, as well as Queen Victoria herself. 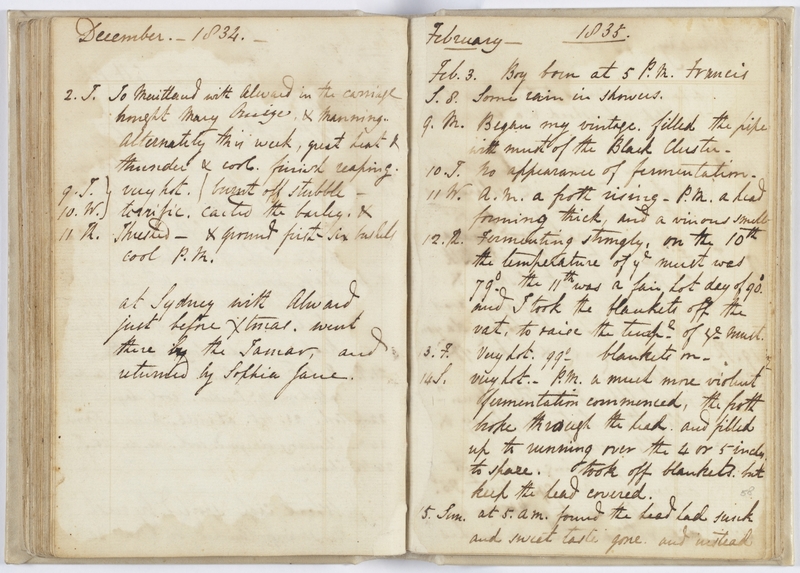 An early diary kept by George Wyndham recorded his daily life and work at Dalwood during 1830-1840. 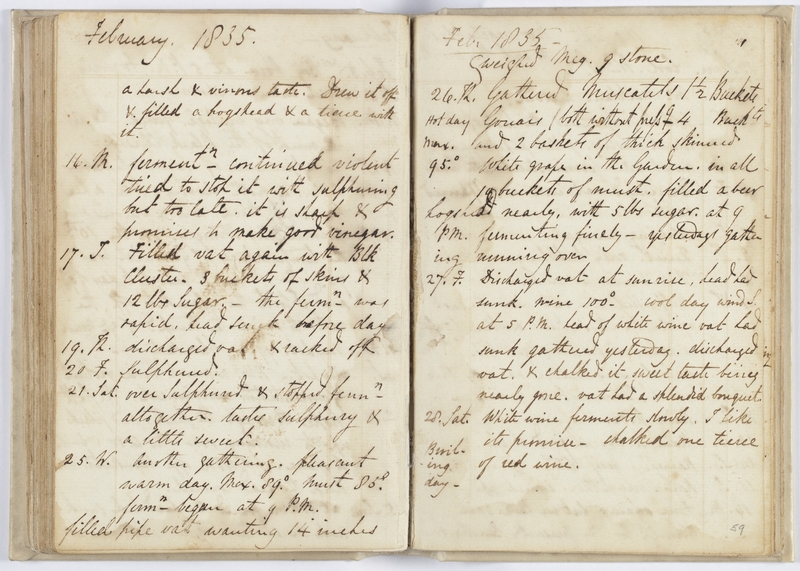 His diary gives a vivid insight into life on the land for pioneer farmers and, more generally, early wine-making techniques in colonial Australia. 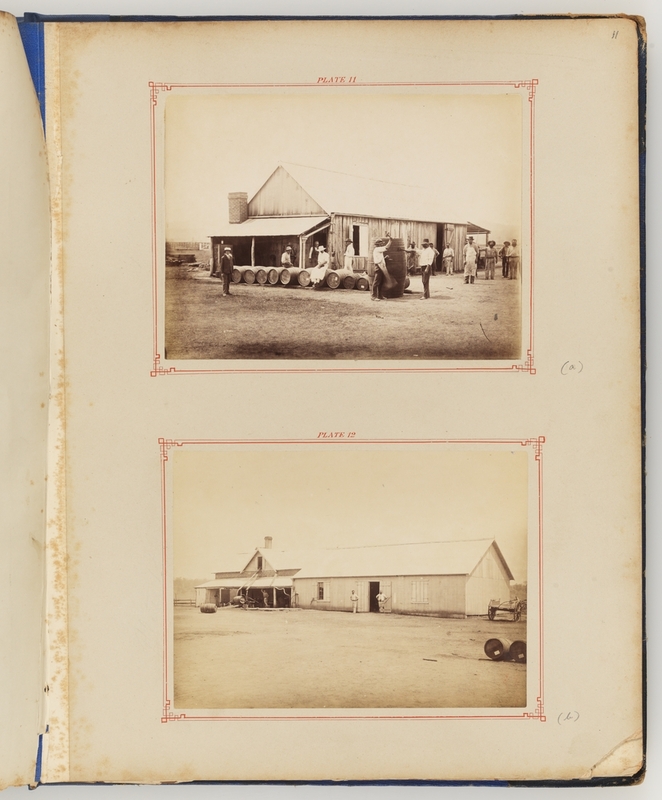 Wyndham describes planting and tending his crops, weather conditions, the building and maintenance of his property, and relationships with family, workers and local Aborigines. Personal family milestones such as the birth of his son, (Feb.3. Boy born at 5 p.m. Francis), sit alongside day to day farming activities. S.8. Some rain in showers. 9.M. Began my vintage. Filled the pipe with must of the Black Cluster. 10.T. No appearance of fermentation. 11 W. A.M. a froth rising - P.M. a head forming thick, and a vinous smell. 3.F. Very hot 99 deg. Blankets on. 14.S. Very hot. P.M. a much more violent fermentation commenced, the froth broke through the head and filled up to running over the 4 or 5 inches to spare. Took off blankets but kept the head covered. a harsh & vinous taste. Drew it off & filled a hogshead & a [indecipherable] with it. 16.M. Fermentn. Continued violent tried to stop it with sulphuring but too late. It is sharp & promises to make good vinegar. 17.T. Filled vat again with Blk. Cluster. 3 buckets of skins & 12 lbs. sugar - ferm. Was rapid, [indecipherable] before day. 21.Sat. over Sulphured & stopped fermn. Altogether. Tastes sulphury & a little sweet. 25.W. Another gathering. Pleasant warm day. Max. 89 deg. Must 85 deg fermn began at 9 P.M. filled pipe vat wanting 14 inches. 26, Th. Weighed Meg. 9 stone. Gathered Muscatels 1 ½ buckets Hot day. Gonars/both without press 4 Back to max. and 2 baskets of thick skinned. 95 deg. White grape in the Garden. In all 10 buckets of mush, filled a beer hogshead nearly, with 5 lbs. sugar at 9 P.M. fermenting finely - yesterdays gathering running over. 17.F. Discharged vat at sunrise, head had sunk. Wine 100 deg - cool day wind S. at 5 P.M. head of white wine vat had sunk gathered yesterday. Discharged vat & chalked it, sweet taste being nearly gone. vat had a splendid bouquet. No vegetables to eat this month. 1.Sun. Cool. W - S.
6.F. Discharged vat into a sulphured cask. 9.M. Put it into the cellar. 13.F. Rain A.M. a good deal. 21.Sat. Grapes growing sweetly occasional showers to April 12. when a heavy hail storm with thunder now and then the land was too wet to plough yet the ground was not soaked below the furrow. It is too wet this day April 14 P.M. the hail storm and last night’s rain. April 1st. 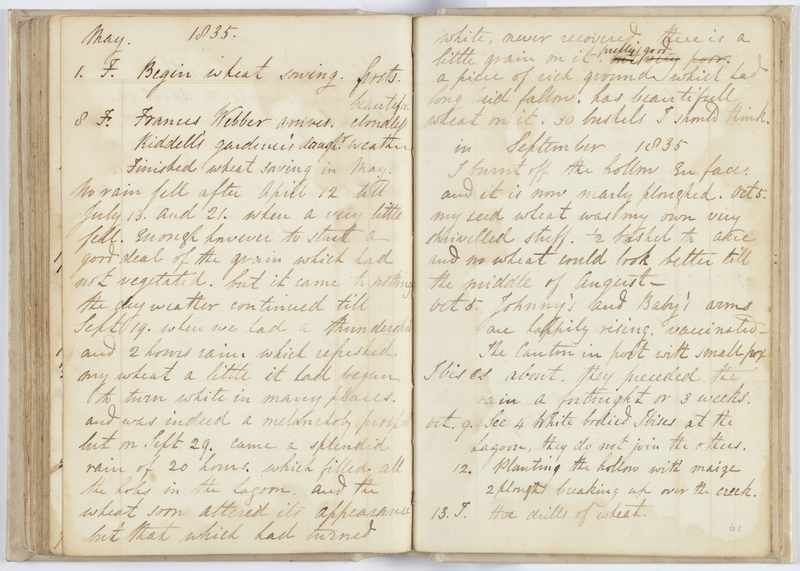 Mary Smith begins walking." 1.F. Begin wheat sowing. Frosts. S.F. Frances Webber arrives. Beautiful cloudless weather. 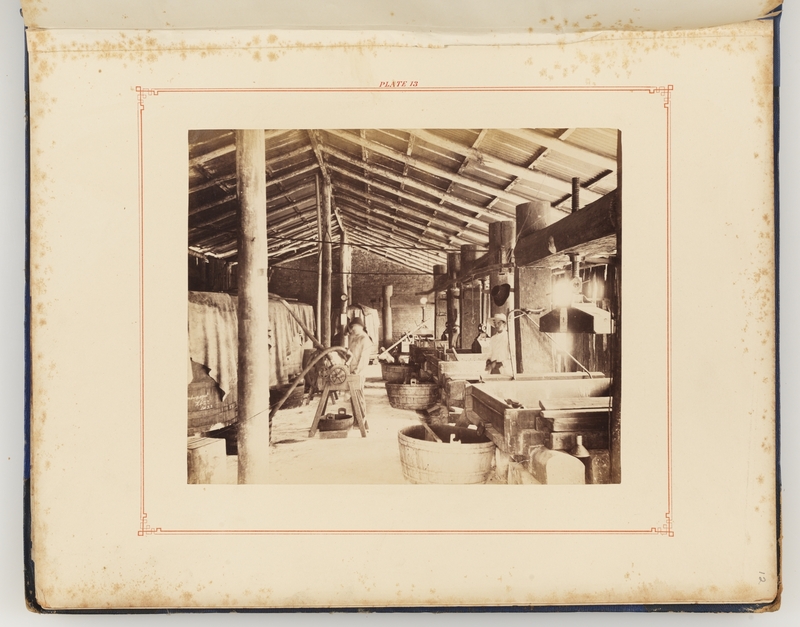 Riddell’s gardeners daughtr. Finished wheat saving in May. white, never recovered. There is a little grain on it pretty good – a piece of sick ground which had long laid fallow has beautifull wheat on it. 30 bushels I should think. Oct. 5 Johnny’s and baby’s arms are happily rising. 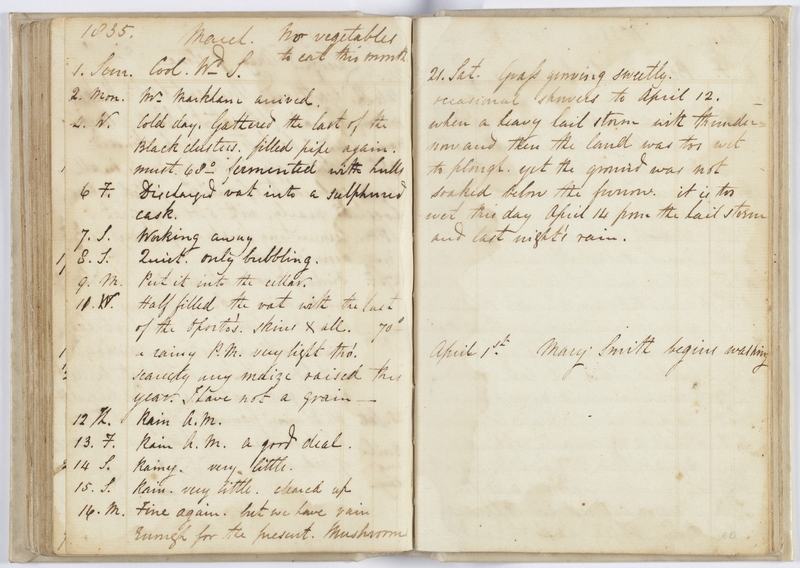 Vaccinated – the [indecipherable] in post with small pox. Ibises about. They preceded the rain a fortnight or 3 weeks. Oct.9. See 4 white bodied Ibises at the Lagoon, they do not join the others. 12. Planting the hollow with maize 2 ploughs breaking up over the creek. 12.T. Hoe drills of wheat."